June 2018 - Hotspex, Inc.June 2018 - Hotspex, Inc.
Case study on how Hotspex used applied behavioral science and Google’s machine learning to create innovative advertising. Marketing is more complex than ever as FAANG (Facebook, Amazon, Apple Netflix and Google) have changed the rules on how brands connect and create commerce with the world’s consumers. Hotspex uses the GRIT report to guide our innovation agenda and to the GRIT’s most innovative rankings as proof that we are headed in the right strategic direction. If you haven’t read it yet, we strongly encourage doing so. You can download it here. 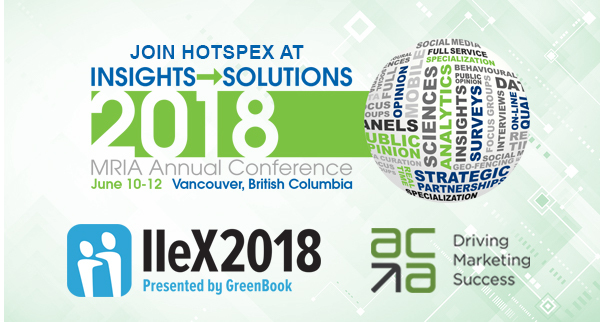 As part of our celebration of being voted the most innovative insights firm in North America, Hotspex will be presenting at 3 events over 5 days to share our most recent insights innovation. The focus of these talks will be our recent integration of behavioral science expertise with Google deep machine learning and the impact this new solution has had in helping our clients demonstrate ROI to their executive teams. MRIA Conference in Vancouver – Monday June 11: Our June conference thought leadership sessions kick of in Vancouver at the MRIA conference on Monday June 11 from 3:30-3:50 as Shane shares What’s Keeping CMOs Up at Night? IIeX Conference in Atlanta – Tuesday June 12: Join us at IIeX in Atlanta on Tuesday from 2:00-2:20pm as Shane and John Wearing from PHD Media share how we are helping CMOs improve their Return on Marketing Investment (ROMI) through a revolutionary new media solution in our talk A Brand New Hotspex/Google Powered Solution to help CMO’s Sleep Better. ACA Event in Toronto – Friday June 15: Hotspex wraps up its June speaker series at the ACA Executive Forum on June 15th at 10:30am that features the latest disruptive innovations in TV and digital advertising. Join us for our talk How to Match Ads to a Consumer Mood. Bring one of these talks (and free lunch) directly to your team: Can’t join us at any of these events? Don’t worry, you can email us and we would be happy to replicate the experience for your team by running a complimentary lunch and learn customized to your learning objectives. The Greenbook Research Industry Trends (GRIT) Report is a critical read for both clients and suppliers in the market research and insights industry. A ranking of our industry’s most innovative clients and suppliers. The GRIT report is fueled by the biannual survey of global clients and suppliers. The 2018 Q1/Q2 edition had the largest sample of respondents in its history with 3930 completed interviews, a 50% increase over the previous year’s participation. To celebrate Hotspex being voted by clients as the #1 most innovative insights firm in North America (#8 globally, up from #16 in 2017), we will be sharing a 4-part series on insights innovation. This article is the first of this 4-part series and is focused on the key highlights and implications from this year’s GRIT survey. Our industry is under intense disruptive pressures, but in the short term, the insights industry seems to be in a relatively healthy state according to the client budgets and supplier revenue reported in this year’s GRIT report. Over half of the buyers in the GRIT survey have the same budget that they did last year. The remainder of respondents were split, with 18% reporting increased budgets and 18% reporting decreased budgets, while another 14% were unaware of their company’s revenue. Drivers of increasing budgets include expanding markets, increasing customer bases, and mandates to become more customer-centric, whereas zero based budgeting was referenced as the biggest driver of a decline in budgets. From a supplier perspective, more than 55% of firms reported an increase in revenue, 14% holding steady, 16% declining, and 14% unaware of their firm’s revenue. While we are encouraged by the 2018 GRIT report’s indicators on client budget and supplier revenue, as well as our own performance (Hotspex has grown over 30% versus 2017 year to date), we believe that our industry is facing an incredible transformation and the key to thriving within it is to focus on innovation that delivers impact and helps our clients excel in their organizations. As has been the theme for several years now, there is a drive towards insights suppliers delivering solutions that are faster, cheaper, and better. In the face of internal pressures, insights leaders are looking to deliver results to their stakeholders sooner and at lower costs. While that resolves the “faster and cheaper” side of the equation, insights leaders also have to focus on delivering impact given that the marketing department is under increasing pressure to demonstrate impact and ROI, especially in the FMCG space. To deliver against this “better” side of the equation, several clients have either adopted or are exploring new behavioral science and implicit, non-conscious measurement techniques. This year’s GRIT report also shared significant insight into the future of our industry by exploring important topics such as automation, blockchain, and GDPR. Of these topics, automation seems to have the highest level of awareness and maturity as more than half of respondents have already implemented or are piloting automation. The most relevant use cases to date are for charting/infographics, survey and text data analysis, and social media analysis. Alternatively, most respondents were not as well-versed when it came to GDPR and blockchain. Only 12% of respondents believed that their company was GDPR compliant and more than half of our industry was not familiar with blockchain. From a Hotspex perspective, we believe that artificial intelligence and deep learning technology needs to be added to the discussion, as it will have a significant impact on our industry in the coming years. It was a topic that was referenced frequently at the most recent IIeX Amsterdam conference. 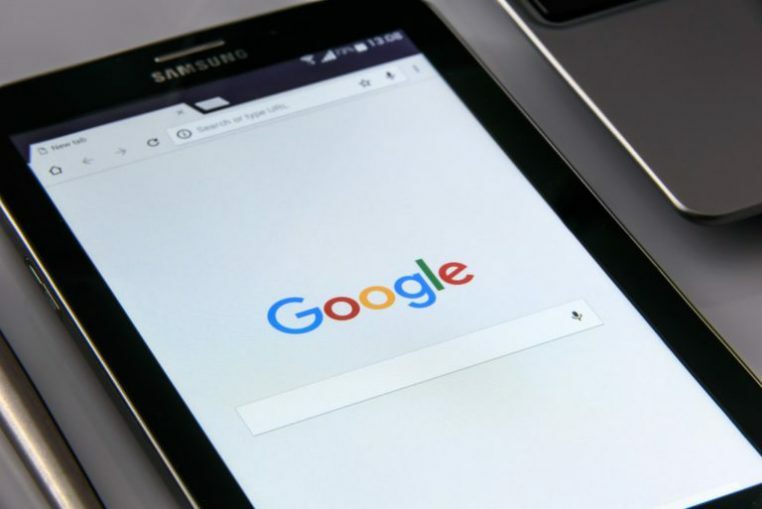 Hotspex has invested in this area, which has led to our recent integration of our behavioral science expertise with Google’s deep machine learning to improve advertising effectiveness. This will be the subject one of our future articles in this 4-part series on insights innovation. While fear is often associated with disruption, we also recognize that change fuels innovation if you can be flexible and adaptive. Clients also dialed up the importance of balancing the need for new tools that lead to faster, cheaper, and better insights without losing the softer, human touch that allows for flexibility and familiarity. From a supplier side, the Top 10 most innovative insights firms remained relatively consistent with Kantar taking over #1 after reorganizing several of its brands into one unified brand. Hotspex is extremely excited to join the “Big 3” (Kantar, Ipsos, Nielsen), as well as other leading consultancies and tech players such as System 1, Zappistore, and Research Now in the Top 10 most innovative consultancies worldwide. To become the #8 most innovative insights firm globally, we doubled the number of votes we received from 2017, which had previously doubled the number of votes we had received in 2016. 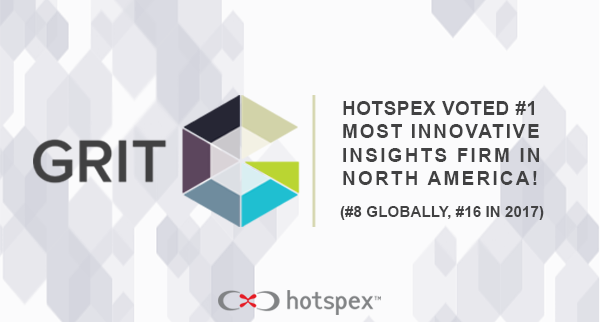 We are also incredibly grateful to our clients for having voted us as the #1 most innovative insights firm in North America and equally proud of our team at Hotspex that made this possible. 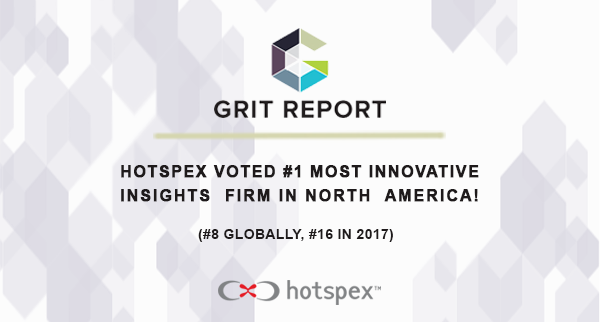 Hotspex uses the GRIT report to guide our innovation agenda and to the GRIT’s most innovative rankings as proof that we are headed in the right strategic direction. If you haven’t read it yet, we strongly encourage doing so. You can download it here. We are also kicking off our summer insights thought leadership series that will feature interviews with top global insights leaders to inform how they are leveraging innovation to respond to the intense pressures our industry is facing. All participating insights leaders will receive their own promotional video following their interview. If you have a strong opinion regarding the insights industry and are interested in learning more, please let me know.